There’s something about cutting into a decadent, juicy steak that feels oh so good… yet oh so bad. We’ve heard for years to cut out red meat to save ourselves, yet it’s not enough to keep us away. In fact, 2018 saw Americans eating a record amount of meat, even with all the backlash. But now the time comes to put that guilt away and grab your steak knife with confidence. Because your steak is getting a bad rap. 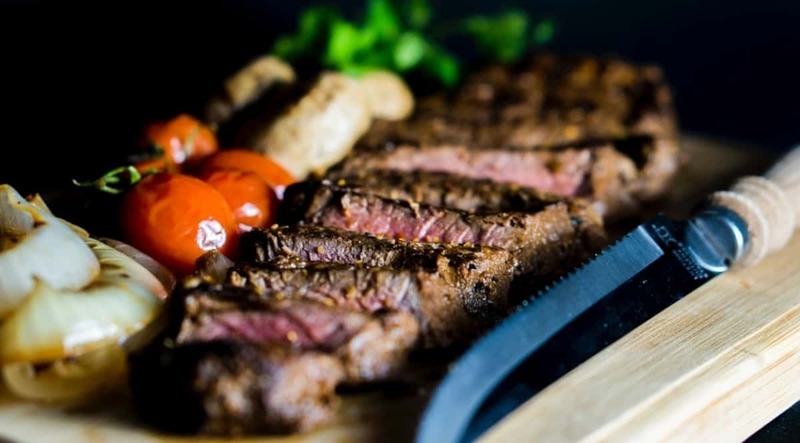 There are actually many health benefits to eating steak that you need to know about. Let’s look at the top reasons why you should be eating steak. One of the key ingredients to a balanced diet is getting in all the vitamins, minerals, and nutrients your body needs to maintain best health. And steak is chock-full of naturally occurring nutrients, more so than many other foods. And that’s only a sample listing. Even though it looks like the ingredients on the side of a multi-vitamin bottle, it’s only some of the many nutrients you’ll find in a steak. Nutrients your body needs to thrive and maintain it’s health. It’s no secret that steak is a great source of protein. But many people don’t understand the amazing benefits that protein can have on their body. Healthy meats provide us with protein needed to build and maintain our muscles. It helps repair damage to our skin, bones, and cartilage. And it’s the fuel that keeps us going during physical activity. And as we age, it’s more important than ever to build and maintain our muscle mass. Having a deficiency in protein can lead to muscle atrophy, which deteriorates our muscles, causing loss of energy and increased health risks. A lean steak is full of these beneficial proteins. Giving us the building blocks we need to stay strong, healthy, and feeling energized to power through our everyday lives. Red meat has long been painted as the bad guy to any heart healthy diet. With its high fat content, we’ve been told to cut our consumption of it… much to our carnivore dismay. But in fact, the fat contained in steak is mostly monounsaturated. Especially when choosing lean cuts of meat. That can help reduce our risk of stroke and heart disease by lowering our body’s bad cholesterol. Your fight against bad cholesterol is also getting help from the presence of niacin. Plus, Vitamin B-12 is protecting you from the risk of heart attacks and strokes. And the good news doesn’t end there. Grass-fed steak is also high in omega-3 and conjugated linoleic acid, which both also contribute to a healthy heart. It’s estimated that almost 80 percent of the population doesn’t have enough iron levels in their system. And that can lead to anemia, a potentially serious blood condition. Luckily, steak carries high amounts of iron. In fact, it has the highest concentration of iron over other meats, which includes chicken and pork. And if that doesn’t sound good enough, eating steak will give you the best form of iron available. That’s because it contains heme iron, a form our bodies find easier to absorb, which makes it work more efficiently than non-heme iron found in green vegetables. But don’t put the side salad down yet. Eating your main course of steak will help your body better absorb the non-heme iron it gets through plants. Giving your health the iron boost it needs. Maintaining a healthy weight is a struggle for many. Especially when they feel deprived of the great tasting foods they love. But a nice, juicy, lean cut steak doesn’t have to be one of those casualties. When eaten in moderation, you can have your steak and lose weight too. That’s because steak contains conjugated linoleic acid, which is a natural fatty acid that helps decrease body fat and increase beneficial lean muscle mass. It’s great source of protein also helps keep you feeling fuller longer, which will decrease the number of calories you bring in throughout the day. In fact, protein is better than carbohydrates in helping you feel full and satisfied. And eating a steak just tastes good, which can be a lacking component for many watching their diet. You can learn more ways to season and cook your steak to give you flavor varieties. You can almost hear the angels sing over this one. A “master antioxidant” is as good as it sounds. And eating steak helps our bodies keep it in good supply. Glutathione is what we’re referring to here. It helps keep our immune systems strong, gives us anti-aging benefits, and reduces the risk of chronic disease by protecting every cell in our body from damage. If our bodies don’t have enough glutathione, free radicals run amok, creating oxidative stress and inflammation. Steak not only contains a good supply of complete dietary glutathione, it keeps our levels of amino acids up. And that helps our bodies produce more of the this needed “master antioxidant”. Don’t let the nay-sayers ruin your next steak dinner. Now that you know what the top health benefits of eating steak are, you can eat it in moderation and order with confidence. But whether you decide to pair it with ketchup or steak sauce is on you. Craving even more protein in your diet? Check out these 5 protein rich meals to complete your exercise routine!